Is the housing recovery over? Housing starts were down in January (and down slightly year-over-year). The MBA mortgage purchase index is at the lowest level since September 2011. Existing home sales were weak in January (to be released tomorrow). Oh no. Oh no. Is the sky falling? There are several reasons for the recent weakness: weather (probably a small factor), higher mortgage rates, and higher prices (homebuilders raised prices sharply in 2013). But the fundamentals of household formation and housing supply suggest a significant increase in housing starts over the next few years. So I'm not too concerned about short term weakness. 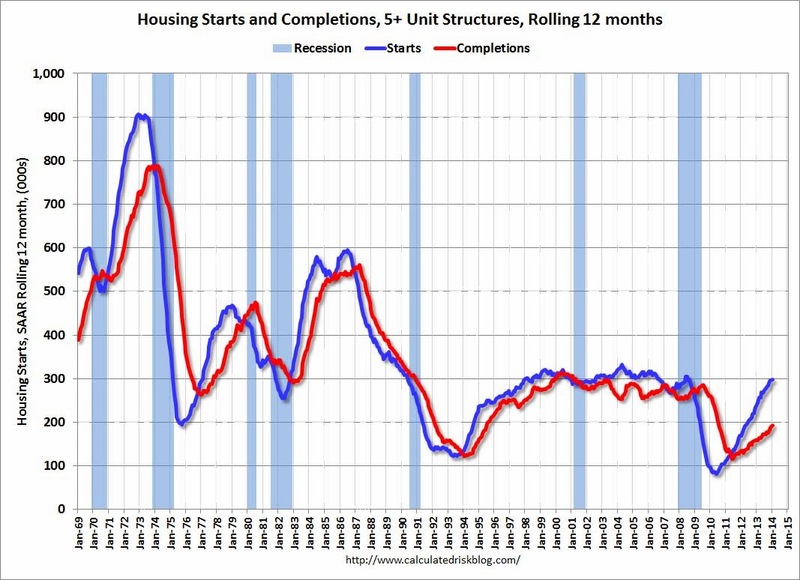 As always, fundamentals will eventually rule, and I think that means housing starts will continue to increase for the next few years. • Housing starts were revised up for 2013, and starts increased 18.7% in 2013 compared to 2012 (revised up from 18.3%). • Even after increasing 28% in 2012 and 18% in 2013, the 927 thousand housing starts in 2013 were the sixth lowest on an annual basis since the Census Bureau started tracking starts in 1959 (the three lowest years were 2008 through 2012). Also, this was the fifth lowest year for single family starts since 1959 (only 2009 through 2012 were lower). See bottom graphs for single family starts! • Starts averaged 1.5 million per year from 1959 through 2000. Demographics and household formation suggests starts will return to close to that level over the next few years. That means starts will probably increase another 50%+ from the 2013 level. 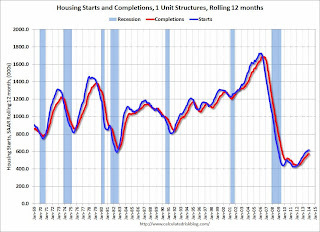 I expect another solid increase for housing starts in 2014. The rolling 12 month total for starts (blue line) has been increasing steadily, and completions (red line) are lagging behind - but completions will continue to follow starts up (completions lag starts by about 12 months). This means there will be an increase in multi-family completions in 2014, but probably still below the 1997 through 2007 level of multi-family completions. 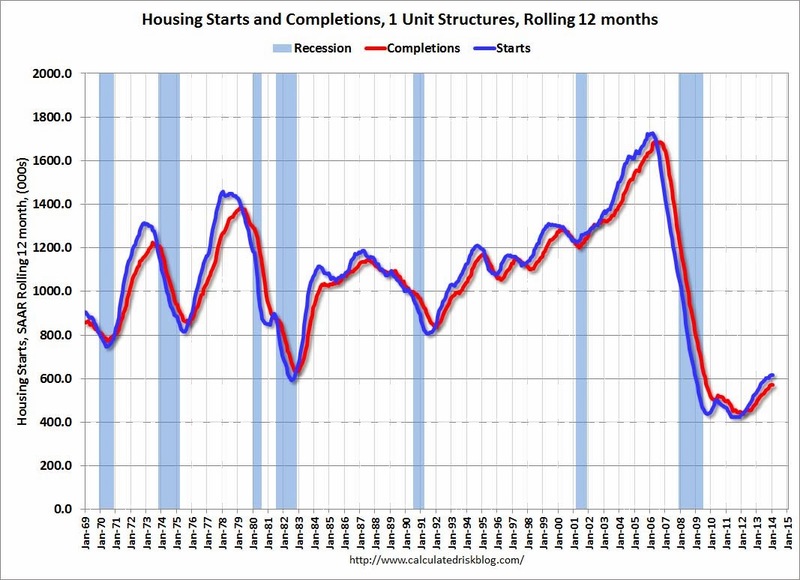 Multi-family starts will probably move more sideways in 2014. 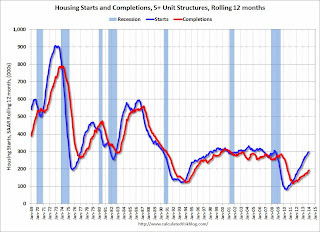 Starts have been moving up, and completions have followed.